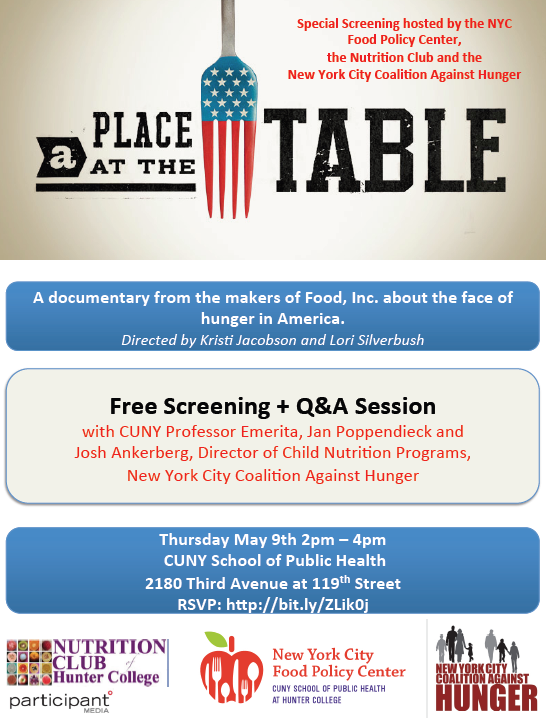 The NYC Food Policy Center, Hunter’s Graduate Student Nutrition Club and the NYC Coalition Against Hunger will be hosting a FREE screening of A Place at the Table, a new groundbreaking film on hunger in America, on Thursday, May 9th from 2 to 4 PM at the CUNY School of Public Health. From the people that brought us An Inconvenient Truth, The Help, Food Inc. and Waiting for Superman, this documentary examines the issue of hunger in America. It is in our best interest that we make healthy food available and affordable because right now we are facing serious economic, social and cultural implications for our nation. One in four children in the United States do not know where their next meal is coming from.